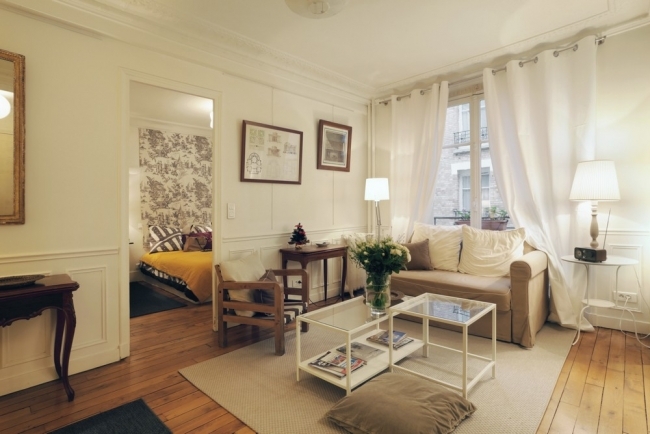 The « village of the Batignolles » is a typical Parisian neighborhood, the most living part of the 17th arrondissement. 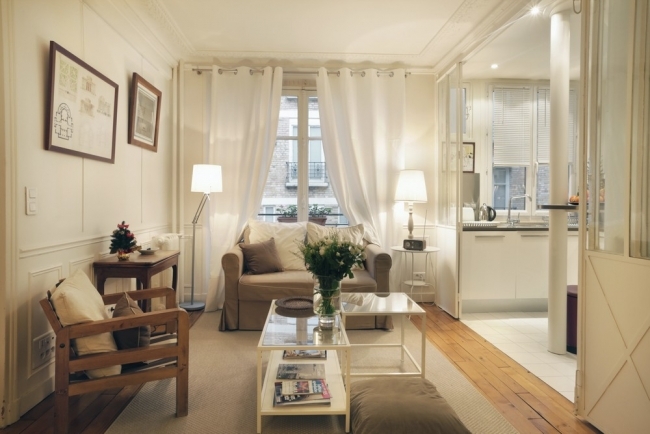 The Batignolles was previously a town that had been joint to Paris in 1860 by Napoleon III. Therefore, the farmers of this town had to live with the Parisian bourgeoisie. This urban and rural mix with moderate rent attracted many artists and Les Batignolles soon became a popular and trendy meeting place for artists, such as Manet, Bazille, Renoir, Cézanne, Monet, Zola, Verlaine or Mallarmé, with his famous “Rue de Rome Tuesdays” (he used to host his friends - Paul Verlaine, Oscar Wilde, André Gide, Paul Valéry, Paul Claudel… - at his place located 89 rue Rome). Since, Les Batignolles has kept this trendy and intellectual side. It’s nowadays a very living place, with many restaurants and stores. 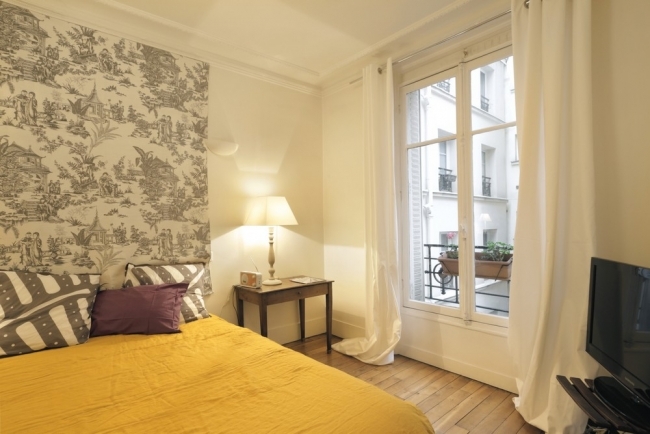 The apartment itself is located Rue de Rome, close to public transportation. 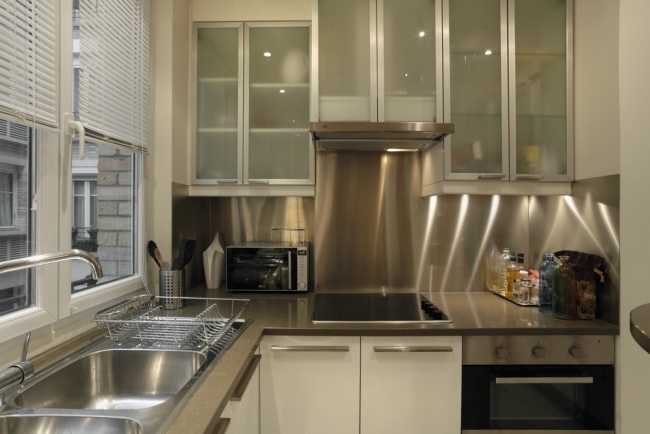 A wide cover market with quality products is close to the apartment. You can easily reach Montmartre by metro (2 stops). Metro line 2 will drive you directly to the Arc de Triomphe with its famous Champs Elysées (5 stops). The beautiful Opera Garnier and the internationally known department stores (Galeries Lafayette and Le Printemps) are directly reachable by bus or metro. 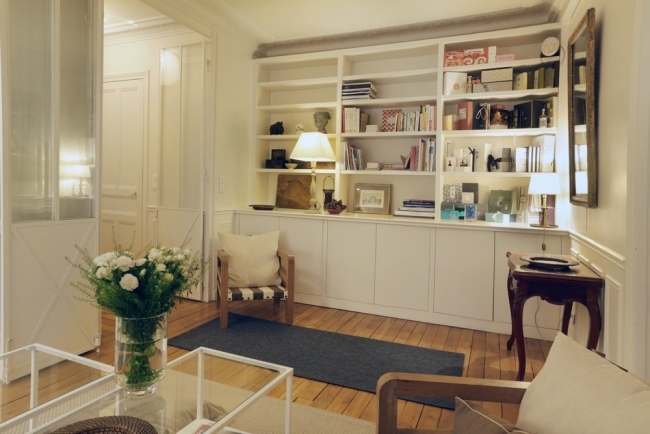 ROME BATIGNOLLES is a beautiful 1-bedroom apartment of 43m², located on the 3rd floor (with elevator). Its decoration is cosy and elegant. 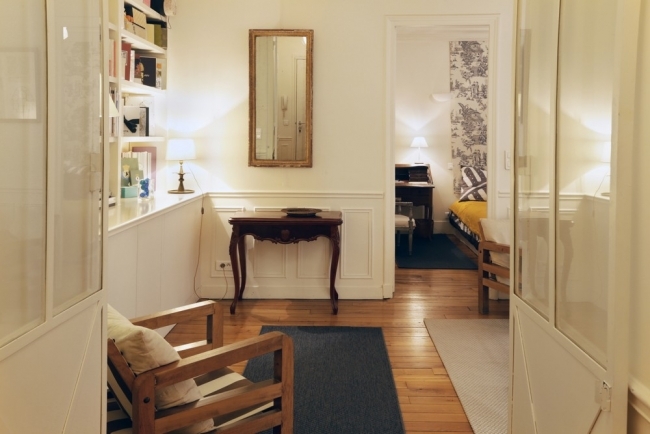 The entrance of the apartment is a 3 m² room (with a 1.20m² closet on one side and a door to the WC on the other part), leading to the living-room. The living-room (15 m² - North/West) has a big window facing a courtyard. It features a comfortable sofa, a coffee table, 2 armchairs, 2 antique game tables, and a wide library. 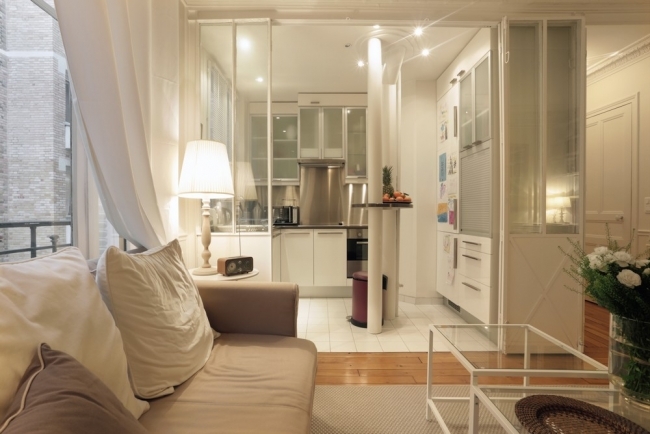 The kitchen (6 m² - North/West) is open on the living-room and can be closed thanks to 2 large window-doors. It also has a big window facing the courtyard. 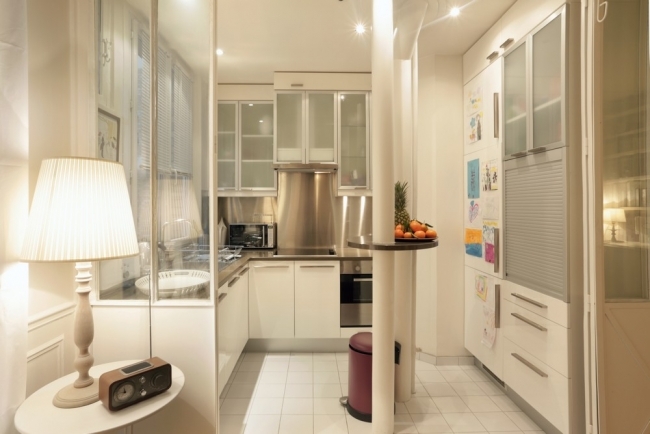 This kitchen is modern and fully equipped: a fridge, a freezer (3 drawers), a traditional oven, a micro-wave, a cooker (4 stoves), a dish-washer, a toaster, an electric kettle. 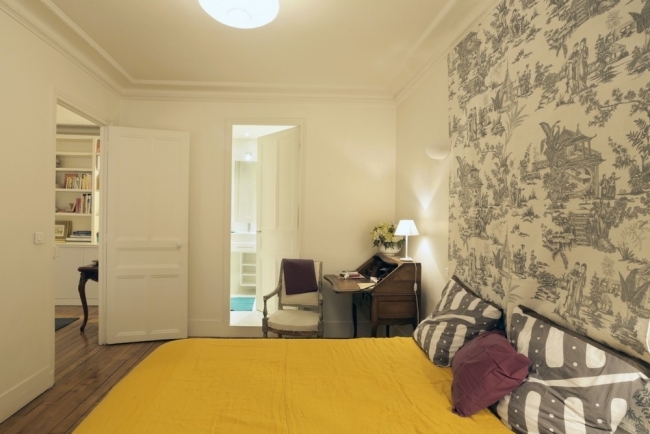 The bedroom (12 m² - North/West) is also facing the courtyard. It has a double bed, a bedside table, an antique desk, an armchair, a chair and a TV. 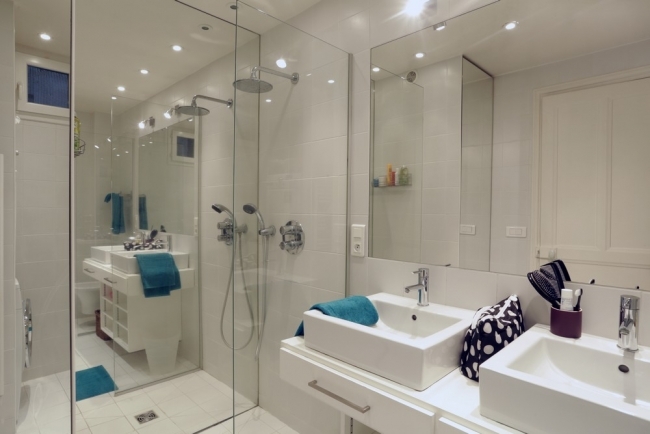 The bathroom (5 m² - a small window for ventilation) is adjacent to the bedroom. 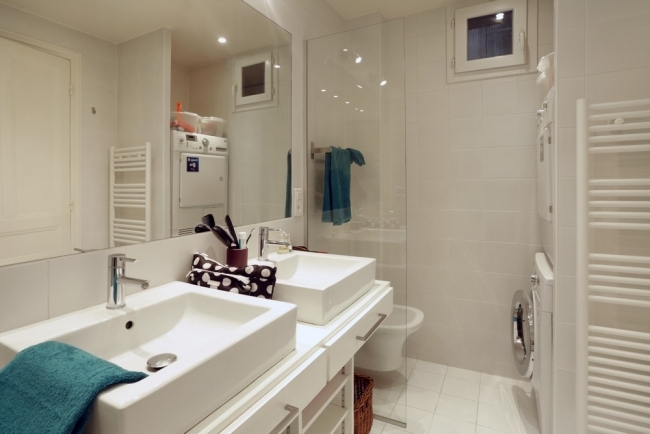 It’s modern and equipped with 2 sinks, a nice Italian shower, a bidet and a washing-machine and a dryer. The WC (1 m²) are at the entrance of the apartment. They feature a small sink. Cost: 11.30 € one way - 5.65 € for children between 4 and 10 (tickets can be purchased at a RATP window or an automatic ticket machine). -Take the ORLYVAL shuttle until « Antony ». -Take the RER B towards « Aéroport Charles de Gaulle / Mitry-Claye » until « Gare du Nord ». 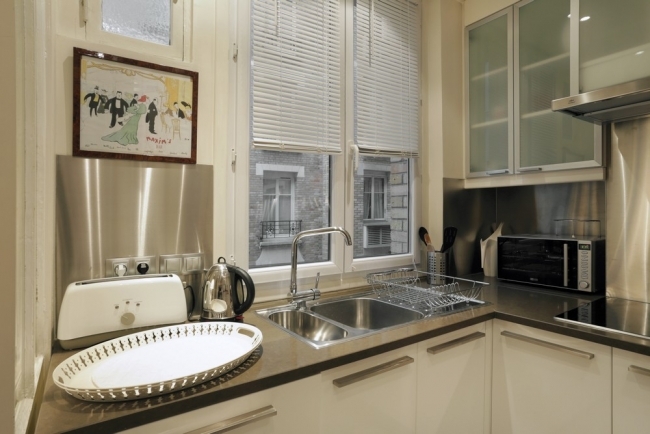 -Transfer to the metro line 2 towards « Porte Dauphine ». -Get off at « Rome ». Cost: 7.20 € (one-way). Tickets can be purchased on the bus. -Take RER line B towards “Aéroport Charles de Gaulle–Mitry-Claye”, and get off at “Gare du Nord”. Cost : 9.50 € one-way (tickets can be purchased at a RATP window or an automatic ticket machine). -Take the RER B towards « Robinson ou Saint Rémy - Les Chevreuse » until « Gare du Nord ». -When you are at Porte Maillot, take the metro line 1 towards « Château de Vincennes » until « Charles de Gaulle - Etoile ». -Transfer to line 2 towards « Nation ». A taxi ride from a train station in inner Paris costs between 6.10€ (minimum rate) and 30€ + 1€ surcharge for every additional suitcase. -Take line 6 towards « Nation » until “Charles de Gaulle Etoile” (last stop). 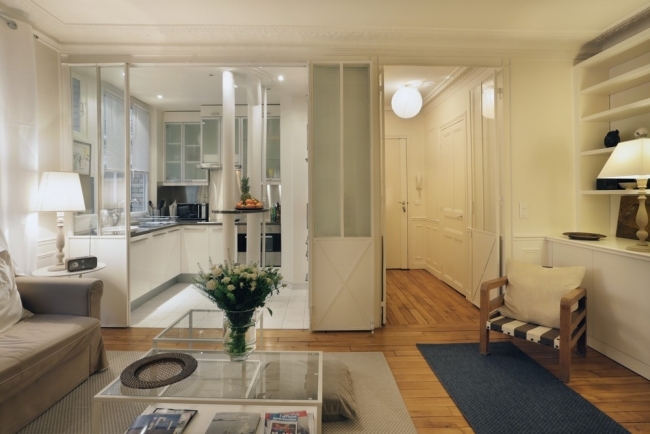 -Walk to the metro station « Barbès-Rochechouart » (when you get off the station, walk on the right on boulevard de Magenta, the metro station is at the end of the boulevard). -Take the metro line 2 towards « Porte Dauphine ». -Take line 3 towards « Pont de Levallois - Bécon ». -Get off at « Villiers ». -Take line 13 towards « Asnières Gennevilliers les Courtilles » and get off at « Place de Clichy ». -Transfer with line 2 towards « Porte Dauphine ». -Take line 5 towards « Bobigny Pablo Picasso » until « Stalingrad ». -Get off at «Rome ». -Take line 1 towards « Nation » until « Nation ». -Take line 4 towards « Porte de Clignancourt » until « Barbès-Rochechouart ». -Take line 3 towards « Pont de Levallois-Bécon » until « Père Lachaise ».